Obituary for Charles Frederick Hole | Crandall Funeral Home Inc.
Chuck was born in Belmond, Iowa to Margaret and Fred Hole. He was raised in Omaha, Nebraska. He graduated from Central High School in 1970. He had many jobs, one of which was with Mutual of Omaha selling insurance. He moved to Green River, WY in 1978 and worked in construction. He was later hired by Allied Chemical which is now Tata Chemicals. He worked there for 34 years and moved his way up to mine foreman. On April 3, 1981 he married Judy Karmelich of Phoenix, Arizona in Scottsdale, Arizona. They have two sons: Steven and Kevin Hole. They were also blessed with a loving daughter-in-law, Hillary, and three grandchildren: Cassidy Henrie, and Taylor and Garrett Hole, whom he adored. 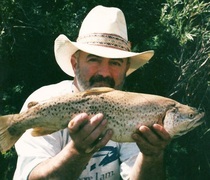 Chuck loved the outdoors, art, fishing, and hunting. He passed these loves on to many members of his family. He was a member of the Knights of Columbus in Fort Bridger, WY. Chuck is survived by his wife, Judy, their children: Steven (Hillary) and Kevin, their grandchildren: Cassidy Henrie, Taylor and Garrett Hole, his mother, Margaret Hole, his brother, Greg Hole and his sister, Lynn Schumacher Hole. He's preceded in death by his father, Frederick Hole and his grandparents: William and Ethel Hole and Loren and Marguerite Heft. A viewing will be held Thursday, September 20, 2018 at 10 a.m. at St. Helen’s Catholic Church in Fort Bridger with the service at 11:00 a.m. Burial will be at the Fort Bridger Cemetery with a luncheon to follow at the church. Memorials can be made to the American Cancer Society or the Hope Lodge in Salt Lake City, Utah.